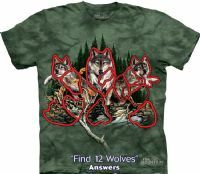 Find 12 Wolves T-shirt is by artist Steven Michael Gardner. This stunning wolf t-shirt features 12 wolves and some are hidden within the image. Can you find them all?